Paying VAT on Water Services? Some customers are required to pay VAT on their water supply. It is important to recognise that VAT is charged only on your water supply charges, not waste or drainage charges. HMRC uses the 1980 Standard Industrial Classification (SIC) activity codes to categorise business activity and identify which customers must be charged VAT on water services. If your business activity falls within divisions 1 to 5 of the Standard Industrial Classification codes you will be liable to pay VAT on your water services. Do you receive water for onward supply to others directly or as part of a service or product your supply to your customers? This is another way to identify if you need to pay VAT on your Water supply. To ensure you are not unnecessary paying VAT please confirm to us that your business activity does not fall within divisions 1 to 5 of the 1980 SIC code. 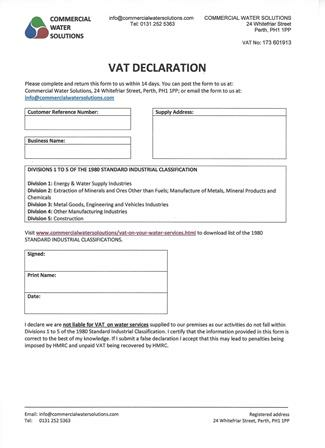 You can do this by downloading and returning this VAT declaration form to us. 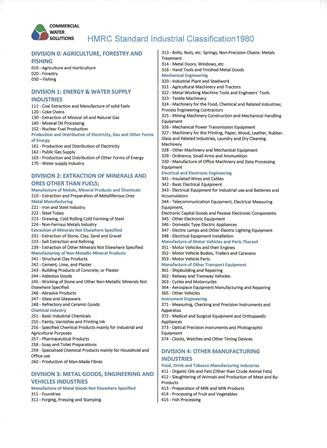 You can also download this list of the 1980 SIC codes to check which code applies to your business activity. Even if you know you do not currently pay VAT on your water services it is important that you let us know so that we can confirm your position with HMRC. Unless you declare to us in writing that you do not pay VAT on your water services we are required by HM Revenue and Customs to charge you VAT at Standard Rates by default.